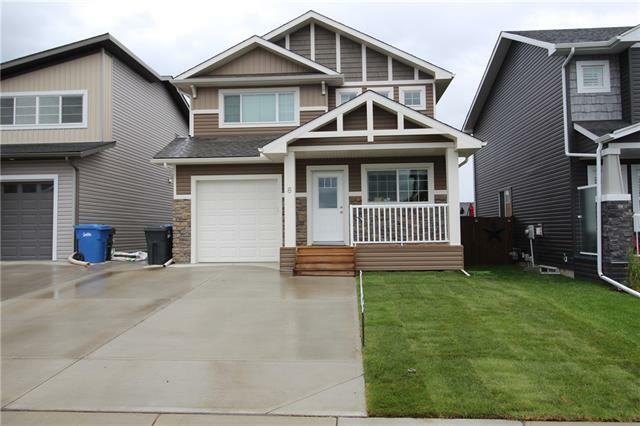 "Looking for a fantastic starter or downsizer home located in the desired neighborhood of Havenfield in Carstairs. Built by a premier, award-winning builder who focused on energy efficiency and solid quality. Enjoy saving on your utility bills for years to come.The main floor of this two-storey,1440 sq ft home is bright and open with living room, dining room and an ample kitchen space including stainless steel appliances, lots of counter and cupboard space with beautiful backsplash. Upstairs you will find the master bedroom with 3 pc en-suite and walk in closet, two additional bedrooms and another 4 piece bath.The basement is ready for future development and has framed in bathroom, bedroom and storage.Create the yard of your dreams in this large, fully fenced back yard.There is a single attached garage and concrete driveway for 2 vehicles.Relax on the front porch and watch the world go by. Short walk to playground and schools. 20 min drive to Airdrie, 40 min to Calgary. See Additional Remarks for upgrades"